The cupola of an underground missile silo, for an R-12 Dvina missile, at former Soviet Plokštinė missile base, Lithuania. A missile launch facility, also known as an underground missile silo, launch facility (LF), or nuclear silo, is a vertical cylindrical structure constructed underground, for the storage and launching of intercontinental ballistic missiles (ICBMs). The La Coupole facility is the earliest known precursor to modern underground missile silos still in existence. It was built by the forces of Nazi Germany in northern Occupied France, between 1943 and 1944, to serve as a launch base for V-2 rockets. The facility was designed with an immense concrete dome to store a large stockpile of V-2s, warheads and fuel, and was intended to launch V-2s on an industrial scale. Dozens of missiles a day were to be fuelled, prepared and rolled just outdoors of the facility's concrete casing, launched from either of two outdoor launch pads in rapid sequence against London and southern England. A similar-purpose but less-developed facility, the Blockhaus d'Eperlecques, had also been built, some 14.4 kilometers (8.9 miles) north-northwest of La Coupole, and closer to intended targets in southeastern England. Following repeated heavy bombing by Allied forces during Operation Crossbow, the Germans were unable to complete construction of the works and the complex never entered service. The United Kingdom conducted post-war investigations, determining that it was "an assembly site for long projectiles most conveniently handled and prepared in a vertical position". The first underground missile silo was built in the 1950s by the United Kingdom, to house their Blue Streak missiles. Only one test underground missile silo was built in the UK, at RAF Spadeadam. The UK cancelled the Blue Streak silo project, since the Soviets had developed missiles that could attack with little warning and insufficient time to arm Blue Streak missiles. The UK's ICBM nuclear missile launch mode was changed in 1960, to submarine-launched ballistic missiles. The German idea of an underground missile silo was adopted and developed by the United States for missile launch facilities for its intercontinental ballistic missiles. Most silos were based in Colorado, Nebraska, North Dakota, South Dakota, Missouri, Montana, Wyoming and other western states. There were three main reasons behind this siting: reducing the flight trajectory between the United States and the Soviet Union, since the missiles would travel north over Canada and the North Pole; increasing the flight trajectory from SLBMs on either seaboard, giving the silos more warning time in the event of a nuclear war; and locating obvious targets as far away as possible from major population centres. They had many defense systems to keep out intruders and other defense systems to prevent destruction (see Safeguard Program). 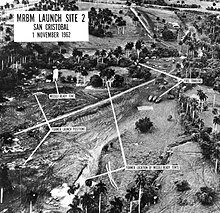 On top of the 3 previous mentioned site reasoning, the US Air Force had other site requirements that were also taken into account such as, having the sites be close enough to a populace of roughly 50,000 people for community support along with with making sure launch locations were far enough apart that a 10 MT detonation on near by strategic locations would not knock out other launch facilities in the area. "In 1960 the US Army established the Corps of Engineers Ballistic Missile Construction Office (CEBMCO), an independent organization under the Chief of Engineers, to supervise construction". This newly established organization was able to produce Minutemen Launch silos at an extremely fast rate of ~1.8 per day from 1961 to 1966 where they built a total of 1,000 Minuteman missile silos. The Atlas missiles used four different storage and launching methods. The first version were vertical and above ground launchers, at Vandenberg Air Force Base on the Central Coast of California. The second version were stored horizontally in a shed-like structure with a retractable roof, to then be raised to the vertical and launched, at Francis E. Warren Air Force Base in Wyoming. The third version were stored horizontally, but better protected in a concrete building known as a "coffin", then raised to the vertical shortly before launch. These rather poorly protected designs were a consequence of the cryogenic liquid fuels used, which required the missiles to be stored unfueled and then be fueled immediately prior to launch. The fourth version were stored vertically in underground silos, for the Atlas F ICBM. They were fueled in the silo, and then since they could not be launched from within the silo, were raised to the surface to launch. The Titan I missile used a similar silo basing of the fourth version. Launch facility (LF) configurations varied by U.S. missile systems. LGM-25C Titan II (deactivated) ICBMs were in a one ICBM launch control center (LCC) with one LF configuration (1 × 1). Titan missiles (both I and II) were located near their command and control operations personnel. Access to the missile was through tunnels connecting the launch control center and launch facility. An example of this can be seen at the Titan Missile Museum, located south of Tucson, Arizona. The solid fueled LGM-30 series Minuteman I, II, III, and Peacekeeper ICBM configurations consist of one LCC that controls ten LFs (1 × 10). Five LCCs and their fifty associated LFs make up a squadron. Three squadrons make up a wing. Measures were taken such that if any one LCC was disabled, a separate LCC within the squadron would take control of its ten ICBMs. The LGM-30 LFs and LCCs are separated by several miles, connected only electronically. This distance ensures that a nuclear attack could only disable a very small number of ICBMs, leaving the rest capable of being launched immediately. Dense Pack was a proposed configuration strategy for basing LGM-118 Peacekeeper ICBMs, developed under the Reagan administration, for the purpose of maximizing their survivability in case of a surprise nuclear first-strike on their silos conducted by a hostile foreign power. According to the Dense Pack strategy, a series of ten to twelve hardened silos would be grouped closely together in a line. This line of silos would generally run north-to-south, as the primary flight path for Soviet inbound nuclear ICBMs would be expected to come from the north over the North Pole. The proposed Dense Pack initiative met with strong criticism in the media and in the government, and the idea was never implemented. The former Soviet Union had missile silos in Russia and adjacent Soviet states during the Cold War, such as the Plokštinė missile base in Lithuania. The Main Centre for Missile Attack Warning, near Solnechnogorsk outside Moscow, was completed in by the Soviet Union in 1971, and remains in use by the Russian Federation. With the introduction of the Soviet UR-100 and the U.S. Titan II missile series, underground silos changed in the 1960s. Both missile series introduced the use of hypergolic propellant, which could be stored in the missiles, allowing for rapid launches. Both countries' liquid fueled missile systems were moved into underground silos. The introduction of solid fuel systems, in the later 1960s, made the silo moving and launching even easier. The underground missile silo has remained the primary missile basing system and launch facility for land-based missiles since the 1960s. The increased accuracy of inertial guidance systems has rendered them somewhat more vulnerable than they were in the 1960s. The U.S. spent considerable effort and funds in the 1970s and 1980s designing a replacement, but none of the new and complex system designs were ever produced. The United States built many missile silos in the Midwest, away from populated areas. Many were built in Colorado, Nebraska, South Dakota, and North Dakota. Today they are still used, although many have been decommissioned and hazardous materials removed. Today they are popular houses and sites of urban exploration. The People's Republic of China, the former Soviet Union and current Russian Federation possess mobile ICBMs. The United States of America had plans to develop mobile ICBMs but these projects were canceled at the end of the Cold War. DF-31 (CSS-9): China, a land-based variant of the submarine-launched JL-2, successor of the DF-4 mobile ICBM. LGM-118 Peacekeeper Mobile Protective Shelters (MPS) Plan: United States, 1976-1980s proposal for 200 LGM-118 Peacekeeper missiles be rotated/shuttled between 4,600 soft shelters. The 1986 Peacekeeper Rail Garrison was adjunct plan of the MPS for 50 Peacekeeper missiles to be deployed on the nation's rail network, developed from 1986 until project was cancelled in 1991. MGM-134 Midgetman: United States, the Small Intercontinental Ballistic Missile (SICBM) program was developed and tested, but the project was cancelled in 1992 before production commenced. RT-2PM Topol: Soviet Union, introduced in 1985, continues in service within the Strategic Missile Troops of the Russian Federation. RT-2PM2 Topol-M: Russian Federation, one of the most recent ICBMs to be deployed, and the first developed in Russia after the dissolution of the Soviet Union. A Soviet MRBM base, photographed during the Cuban Missile Crisis. The inability of ground-based, launch complexes like this one to move makes them susceptible to discovery and long term monitoring by airborne and/or space-based surveillance systems, resulting in a push from some nuclear capable nations to place a greater number of their weapons on more mobile platforms, such as ballistic missile submarines or transporter erector launchers. China has silo-based weapons, but is now concentrating development on expanding its submarine and road-capable mobile weapons, especially for underground tunnel networks. Iran has silo-based weapons, having built a system of underground missile silos to protect missiles from detection and (above-ground) launch facilities from aerial destruction. In the Democratic People's Republic of Korea (DPRK), the North Korea Strategic Rocket Forces (Missile Guidance Bureau) are the strategic missile forces division of the Korean People's Army. The United States has many silo based warheads in service, however, they have lowered their number to around 1800 and have transferred most of their missiles to nuclear submarines and are focusing on more advanced conventional weapons. The increase of decommissioned missile silos has led governments to sell some of them to private individuals. Some buyers convert them into unique homes, ultimate safe rooms, or for other purposes. In 2000 William Leonard Pickard and a partner were convicted, in the largest lysergic acid diethylamide (LSD) manufacturing case in history, of conspiracy to manufacture large quantities of LSD in a decommissioned SM-65 Atlas missile silo near Wamego, Kansas. ^ Sanders, Terence R. B. (1945). "Wizernes". Investigation of the "Heavy" Crossbow Installations in Northern France. Report by the Sanders Mission to the Chairman of the Crossbow Committee. III. Technical details. ^ "Minuteman Missiles on the Great Plain" (web). National Park Service. National Park Service. April 6, 2017. Retrieved February 21, 2019. ^ a b c Winkler, David F.; Lonnquest, John C. (1996-11-01). "To Defend and Deter: The Legacy of the United States Cold War Missile Program".